Because these surgeries either remove one occipital lobe, or cut the fibers which carry the visual message to the affected occipital lobe from the eye, homonymous hemianopia is an unavoidable and irreversible result; however, the effect on function may be different in each child. 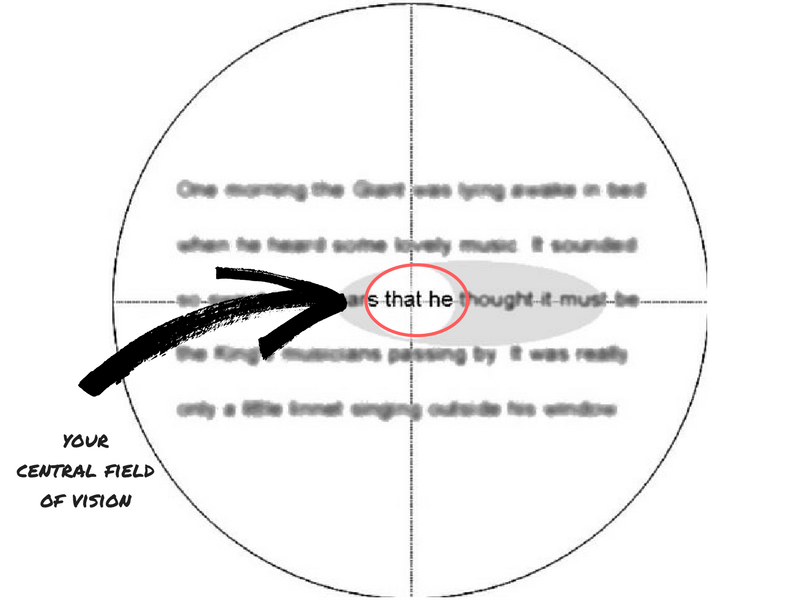 If you think of the entire scene in front of you as huge target with three rings, your central vision is the middle of the target where you would aim your bow and arrow. 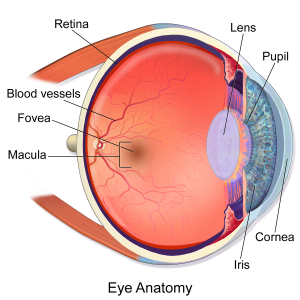 The area that is in sharp focus when you look at something is called the central field or fovea field. This area is actually quite small – only about 5 degrees of your vision is in sharp focus at any given time. And another view. Note how you can see colors in your peripheral vision, but text and words can only be seen in your central vision. The best way to understand your central vision is to extend one arm straight out, make a “thumbs up” gesture with your hand, and look at your thumbnail. You will see that only your thumbnail is in very sharp focus (known as 100% acuity). 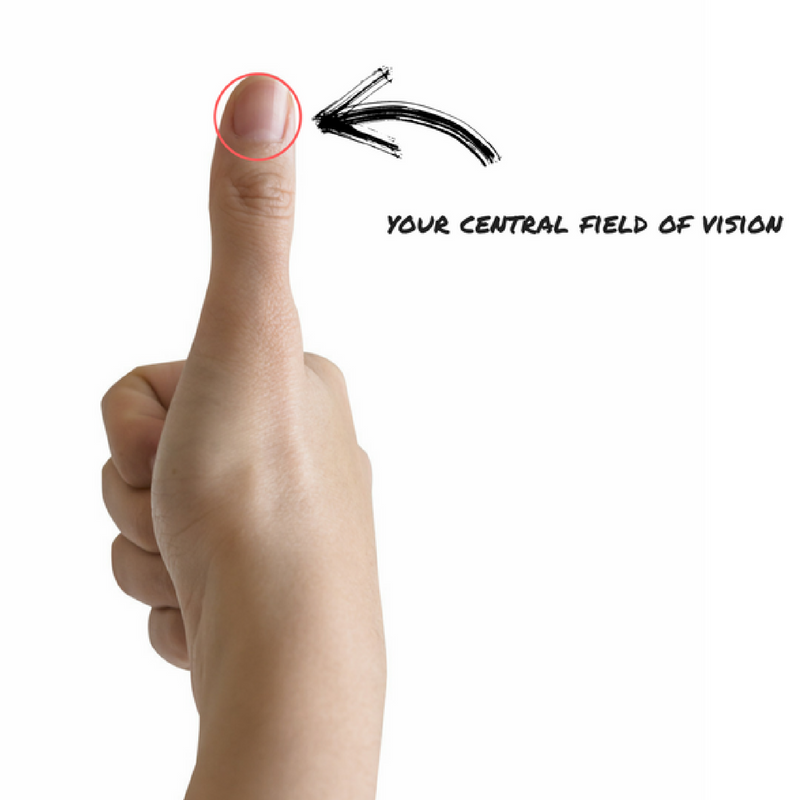 This small area – literally the size of your thumbnail – is your entire central field of vision. Why is only this small area in sharp focus? It’s because each eyeball has a very small pit in the back known as the fovea which is densely packed with only cones – highly specialized photoreceptor cells which allow the perception of color and are able to perceive finer detail and more rapid changes in images. Only the these cone cells provide us with the vision required to see things clearly. Good central vision is very important when reading. This is because your central vision allows you to view about four to five letters in sharp focus at 100% acuity at any given time. 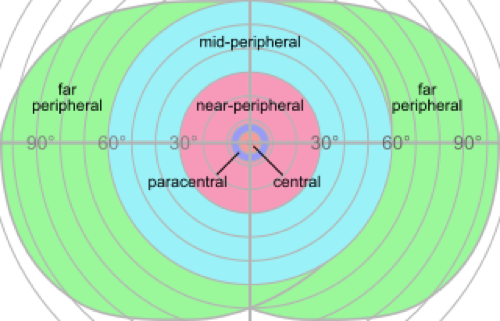 The next ring of the target that is your field of vision is your parafoveal or mid-peripheral field. It allows you to get the “big picture” of the scene in front of you (such as whether a car is pulling up beside you), but things in your parafoveal field are not in sharp focus. 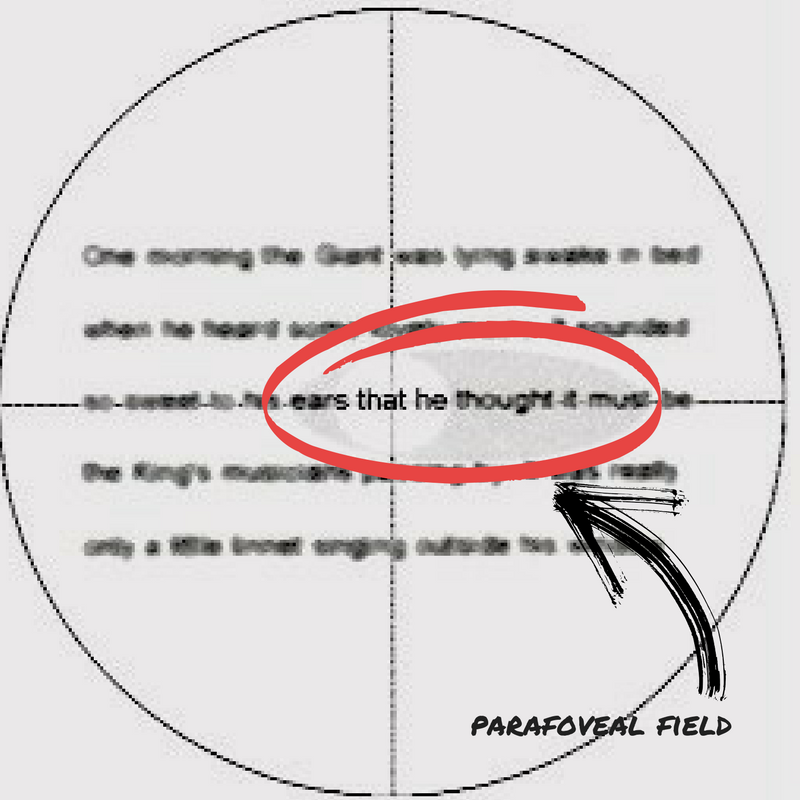 The parafoveal field is especially important when reading languages that are read from left to right, like English or Spanish. This is because the area of the line you are reading – known as the perceptual span – extends about 3 – 4 letters/spaces to the left and up to 15 letters/spaces to the right. This allows you to get an idea of the words that are coming up after the word being read so that you know where to fixate your eyes next. 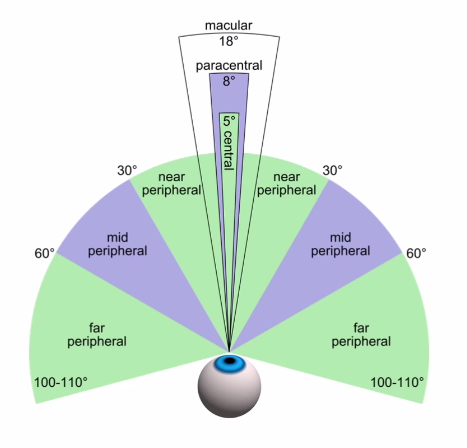 The outermost ring of the target that is your field of vision is your peripheral field or far peripheral field. This is important for seeing movement, but everything is out of focus. The far peripheral field is extremely important when driving a car as it allows you to see the full scene of traffic. It allows the driver to see color and movement, like a pedestrian walking into a crosswalk, signal changes, road signs, warning lights on the dashboard of the vehicle, and gives cues to stay within one’s lane. On the playground, it allows a child to see children running towards them, soccer balls being kicked in their direction, a child in mid-flight on a swing nearby, or a ball falling from the sky. Far peripheral vision is extremely important when crossing the street. It detects the motion of an oncoming car or bus, causing you to shift your gaze to make eye contact with the driver to make sure they stop before you enter the crosswalk.